* You know how for the most part, I mainly just talk about food? Of course there are stories related to the recipes but other than a quick update on what is going on in my life during the weekly menu post, I really don’t share all that much about me, personally. For at least a year now, I’ve said that I was going to join What’s Baking, a group formed by some of the ladies on the cooking board I frequent. There is a host who selects the baking theme for the month they are assigned and everyone makes a recipe within those guidelines. 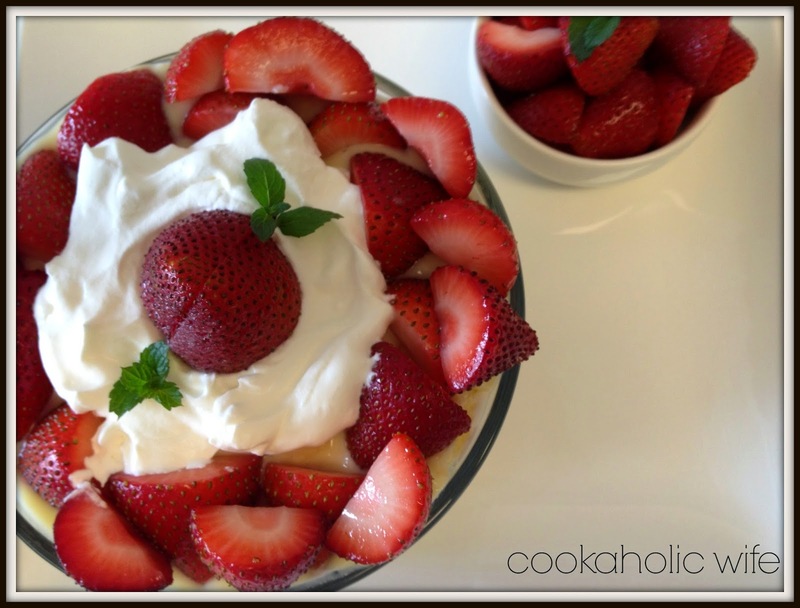 At the end of the month, the host does a round-up post of all the recipes that were shared. There is no due date and all recipes do not need to be shared on the same day. I had never joined before because, well I didn’t know who to ask, and then when someone would post their recipe, I would say “Once I get home tonight I’ll ask them how to join” and then never did. 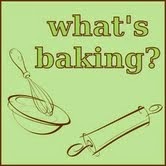 Anyway, I’ve obviously joined seeing as the first two words in the title of this post are “What’s Baking.” Ali, from Sparks in the Kitchen is the host this month. Check back on her blog to see a round up of all the recipes. The theme for this month is heritage recipes. I’m Irish first, Polish second and then who knows what else is mixed in there. Traditional Polish recipes are much easier to find than Irish ones. So, being the logical person I am, I chose to find an Irish recipe to bake. Let me just say that Google is damn useless when it comes to “Irish dessert recipes”. I’m fairly certain the people of Ireland actually make desserts that don’t include Jameson whiskey, Bailey’s Irish cream or Guinness. I tried “traditional Irish dessert recipes” and “non-alcoholic dessert recipes” and still ended up with terrible search results. I feel like it’s kind of insulting, like Google had to Americanize the results for me. Or maybe the people of Ireland just don’t share their recipes? I dunno. Disgruntled, I thought “Wouldn’t it be great if I could just ask someone IN Ireland?” then I realized that was actually a possibility. Here’s where the weird comes in. Or just the part where you find out more about me. Be warned. So, if you’ve ever watched ABC’s Once Upon A Time, you may know that Captain Hook is played by Colin O’Donoghue. Who is Irish (if you couldn’t tell by his name) and also happens to be my only celebrity/tv crush, but that’s an entirely different post (and probably equally as long). Like a good fan, I follow him on Twitter. I forget the specifics, but one day I saw a tweet from Colin to his brother, Allen. I then found that many of Colin’s fans have also followed Allen and like to ask him questions, most relating to Colin. He actually answers them and is quite nice about it, which I thought was cool, because on some level, that’s gotta get annoying. Anyway, before I get too far off topic, I told him his responses to the questions were funny and improved my bad day or something along those lines and then he favorite’d it. I was not expected any reaction at all, so I was thrilled. He said I could make trifle without the alcohol. And I won’t lie, my first thought was “trifle has alcohol?” I’d only made the angel food cake/whipped cream/fruit variety. Off to Google I went, which proved to be a bit more helpful in telling me what went into a trifle with alcohol, however it wasn’t until I found a post about a traditional English trifle did it all start to click. (It was also 5:30 am) To confirm, I was on the right path I decided to bother him again and ask “custard, sponge cake, fruit and whipped cream, right?” And a bit later he confirmed this was correct. I also found that the alcohol is either sherry or maderia and you soak the cake in it, kind of like how you soak the lady fingers in rum to make tiramisu. Of all the things to fascinate me, it was this. And since it wasn’t the overly Americanized “Guinness/whiskey/Irish cream” alcohol, I debated on picking up some sherry and making this the proper way. Then I felt kinda bad for asking the poor man to give me a non-alcoholic recipe and completely ignoring that. I forgot to pick up the sherry so it all worked out in the end. 1. Combine strawberries and sugar in a bowl and toss to coat. Allow to sit until strawberries release their juices. Refrigerate for one hour. 2. Meanwhile, prepare the custard by whisking the milk, egg yolks, sugar and cornstarch together in a mixing bowl until combined. 3. Transfer to a large heavy-bottomed saucepan and heat over medium heat. Stir constantly but 15 minutes or until the mixture has thickened. Remove from the heat immediately and stir in the butter and vanilla until butter has melted. 4. Transfer back to the mixing bowl, cover tightly with plastic wrap and refrigerate for at least 2 hours. This can be done a day in advance. 5. In the bowl of your stand mixer with the whisk attachment, add heavy cream and sugar and beat on high speed until stiff peaks form. Careful not to overmix or it will turn into butter. 6. 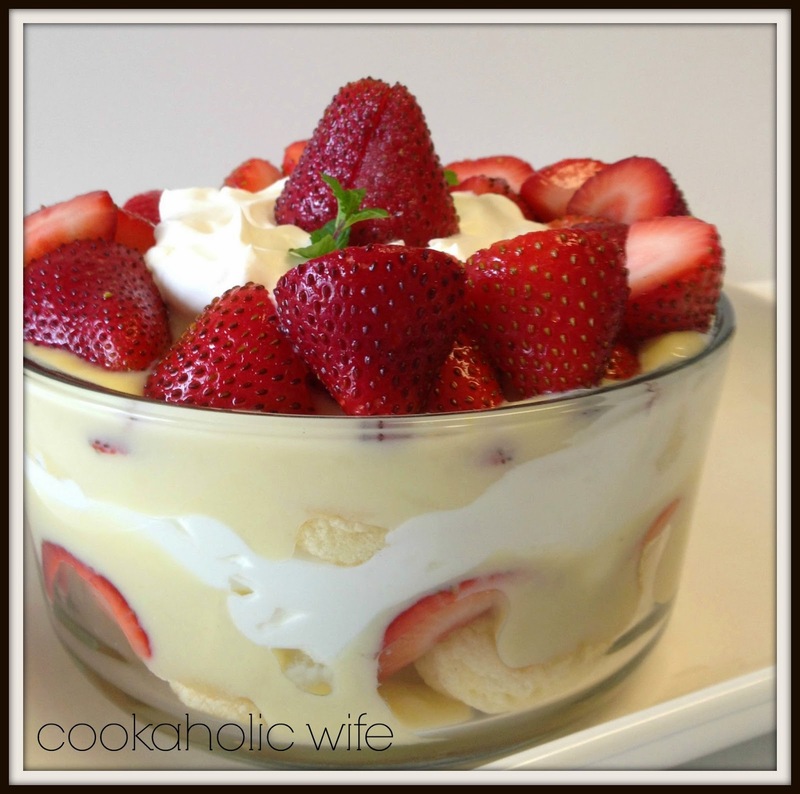 Assemble the trifle by arranging lady fingers on the bottom of a trifle dish/bowl/etc. Add a layer of the strawberries, followed by a layer of the custard. Top with whipped cream and then repeat making a second layer. Garnish the top with the remaining strawberries. 7. Cover and refrigerate for another hour. I really had intended to make this with raspberries as it calls for in the original recipe but they were just not to be found at the store and I didn’t think the frozen route would go over very well. 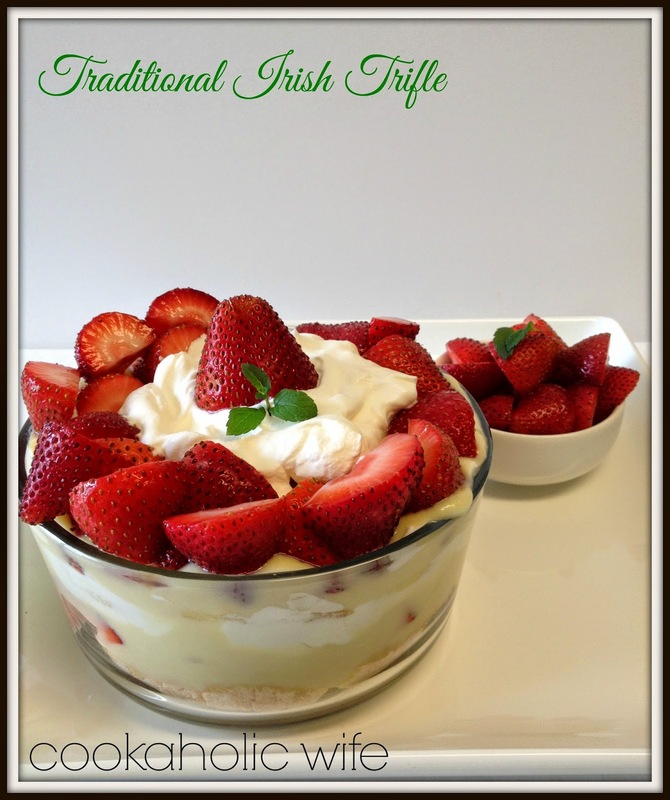 So that and the lack of the sherry meant I changed the name of this recipe from Traditional Irish Sherry Trifle to just an Irish Trifle because I have no idea if I’m still even close to having made something acceptable. I think that just means I should plan a trip to Ireland (not as thought I haven’t always wanted to go) and go seek out some desserts for myself.